The new HP StorageWorks X510 Data Vault (simply Data Vault in all but the most formal of situations) has been introduced to us as a MediaSmart Server that is targeted for the small business market. I recently received an evaluation unit from HP and have spent some time looking over the new server and comparing it to it’s close relative, the MediaSmart Server. 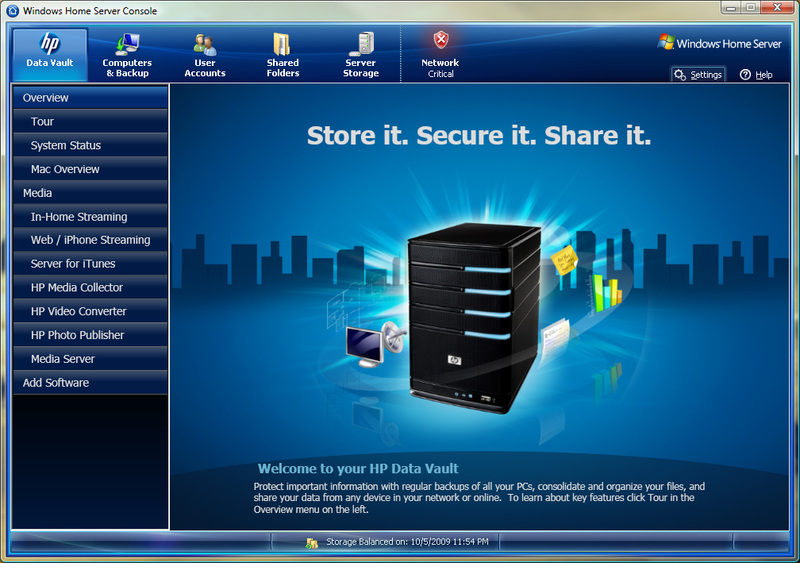 The HP Data Vault features the Windows Home Server Operating system, which is designed to be an easy to use solution that meets the storage, backup, and remote access needs of the average consumer. This feature set is also incredibly compelling to the Small Business. Rather than go into a full explanation of the Windows Home Server features, I’ll refer you to the Microsoft site for a good introduction. 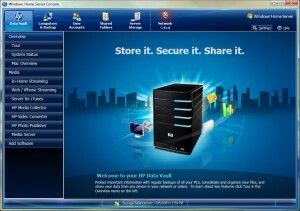 HP has built additional software features that expand on the base Windows Home Server features, allowing the backup of Mac computers, the automatic collection of media files from your client computers to the server, and enhanced remote access features that allow the streaming of media over the internet. 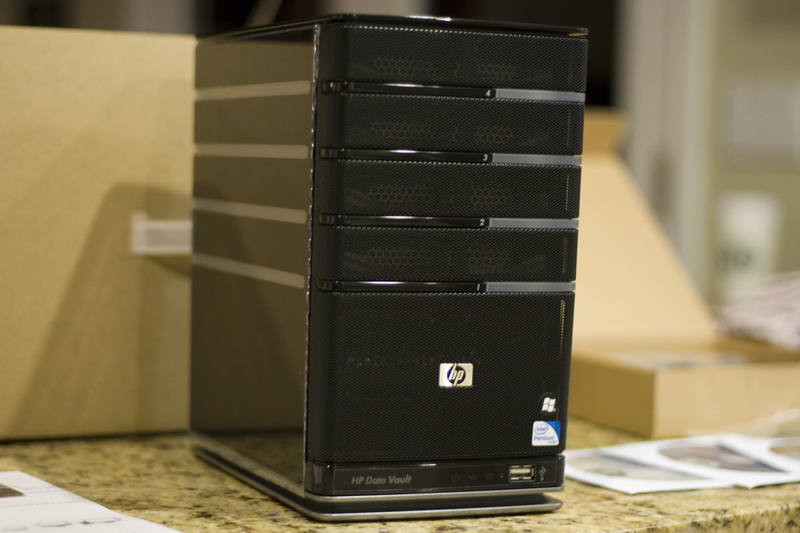 The HP Data Vault is available in three models with the only differentiation being the number and capacity of included hard drives. 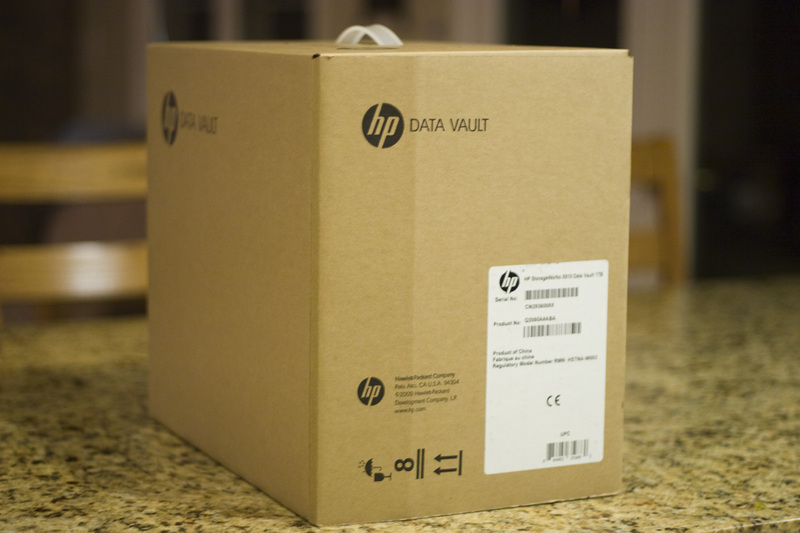 The packaging of the Data Vault is the same improved design as the MediaSmart Server, but in basic brown cardboard rather than full-color retail packaging. The accessories include a power cord, CAT6 ethernet cable, quick start guide, Software Installation CD, PC Restore CD, and Server Recovery DVD. The HP Data Vault leverages the proven platform of the MediaSmart Server, utilizing a low power consumption yet powerful dual-core Intel processor running at 2.5 GHZ. The included 2 GB of RAM allow plenty of headroom to install any Add-Ins such as anti-virus or the forthcoming Online Backup solution. The four USB 2.0 ports and port-multiplier aware eSATA connector provide the opportunity for huge expandability, allowing the Data Vault to keep up with the storage needs of a growing business. The Data Vault has an auto-switching power supply, so only the correct power cord will be needed for delivery of the server to regions outside the US. The power supply and cooling fans are very quiet, much quieter than previous versions of the MediaSmart Server. I opened the case of the Data Vault just to verify that it has the same internal components as the MediaSmart Server EX495, and I can confirm that they are indeed identical. Please see my closer look at the EX495 hardware article for a guide to taking apart the server and a closer look at the internals. Much like the hardware, the Software running on the Data Vault is nearly identical to that running on the new MediaSmart Server EX49x servers. The only real differences are the product name and some minor textual changes that focus less on the media-centric capabilities of the server and more on the “Store/Secure/Share” philosophy that is the basic tenet of Windows Home Server. The software is so close that it even shares the same version number, indicating that the same build was used and only the string files were changed. Given the exact software is used on the Data Vault, I’ll refer you to the review of the 3.0 software in my recent EX495 review article. The “Add Software” tab of the Server Console takes you to the same Add-Ins page as the MediaSmart Server, and it will be interesting to see what additional Add-Ins appear on that page in the future. The HP Data Vault is at this point simply a re-branded HP MediaSmart Server EX495 with some different drive capacities. Not that there’s anything wrong with that, as I indicated in my EX495 review there’s very little to complain about with the new servers. The important difference is the target audience for this product, and the channels to market that are available. I’ve been a longtime proponent of Windows Home Server in the Small Business environment and so am glad to see an OEM targeting this market segment. I think it will be very interesting to watch how sales of the Data Vault perform, and I look forward to seeing the directions that HP takes down the road to distinguish the server from it’s MediaSmart brother. Hi I am currently running a windows Small Business server 2003 at home. It acts as my server, and firewall. It is built on an old AMD K6 processor, and does not have raid support. I have been intregued with WHS since I heard about its launch. I would like to keep my current setup of logging into WSBS 2003, but add the capabilities of WHS for storage, computer backups, and media storage. I am interested in your views on this configuration. I also have a workgroup configuration using WinXP SP2 on most of the computest with about 30 computers connected. Each computer is running a static IP address. Several of these are specialized computers running Avid Mediacomposer Adrenalin software. The Avid software really uses all of the resources the computer has. Therefore I really try to keep these machine a clean of 3rd party software as possible. Yet I would love to be able to backup the OS drives, and have a central server (IE NAS) to store content on that the various machines need access to at times. I had a 2TB Buffalo NAS connected to the Workgroup which worked great, but the NIC card died and Buffalo will not repair devices (even a NAS labeled PRO) outside of warrenty. Can the WHS act as a firewall using 2 NIC cards as WSBS 2003 can. I have the workgroup seprated and connected to the corporate network via a Netgear home router. This way those computers that I install the gateway IP address of the Netgear router can access the internet, but the corporate traffic can’t get to the workgroup. The MediaSmart Server doesn’t have any expansion slots so you wouldn’t be able to add a NIC. You may be able to accomplish this with a home-built WHS, though it would be outside the typical use model of WHS. Also, since WHS has a 10 client limit, you’d need three servers to backup all 30 workstations. It sounds like WHS could be a good complement for your backup and storage needs, but you’d probably need to integrate it into your setup rather than replacing the SBS components. Hi, Does the X510 come with the Mac Client Connector Software? This is an essential piece of information for me, as I want to setup and configure the device on the Mac. The X510 and EX495 are identical in both hardware and software, so yes, it includes the Mac backup feature. This does NOT allow you to perform the initial configuration on a Mac, you need a PC for that, but after it is set up you can manage the server from your Mac. Thanks for the quick response. I was not so much after the Mac Backup feature, more the piece of software referred to as installable on the Mac platform. It is called ‘Mac Client Connector Software V.3′. Also, I am struggling to find out the interface differences that users mention between the EX495 and X510. One more question. You say that after initial set-up you can manage the server from the Mac. I understand that totally. May I ask, is the after-management via the web interface, or via supplied software? As I mention in the review above, the software is identical with the only appreciable difference being the words “DataVault” instead of “MediaSmart Server”. The Mac can access the Windows Home Server Console via RDP, similar to this technique. So what is this I read about Mac Client Connector Software somewhere? Hmmmm, I will have to search it out. Perhaps you try telling us exactly what you are wanting to accomplish, and we can try to help you get there. Sure… being in the UK to get the faster CPU I have to go for the X510. I want to be able to install the Mac Client Connector Software (not mentioned as being included in the UK spec). I then want to be able to use a USB flash memory stick to perform Mac OS Recovery if needed. Again not mentioned as being with the X510, only the EX495. And finally, I want to be sure that all of the Mac media streaming features of the EX495 are present in the X510. I’ve not seen a UK specific spec, but the software is the same as the EX495 and the specs from HP clearly outline the media streaming and Mac backup and restore exist in the Data Vault. Thanks again Alex, you have been very helpful. I noticed on HPs website the the datavault uses ECC ram. Is this true for the 490/495? @zmarke – The EX490/EX495 do not use ECC, and I’d want to check my DataVault at home to be sure that spec is correct. I’ll try to look at that tonight and give an update. Excellent Review Alex I have just placed an order for the X510 I think what Dave meant by “being in the UK to get the faster CPU I have to go for the X510″ is that the EX495 is not sold in the UK so our choice is either take the EX490 and its Celeron or opt for the X510 as I have done. Any idea if the specs for the hard disks are known, or intentionally left out to allow for resellers to install whatever is cheap at the time? I prefer a 7200 over 5400, and would opt for an empty case, purchasing separate drives if possible. Hi Jeff, the server I received had a 1.0TB Seagate 7200.12 Barracuda drive. HP has been using the Seagate Barracuda 7200.x drives in all the MediaSmart Server’s, with the only differences being the capacity and revision. Hi Alex, That is good news. Up until reading your reviews, I was going to buy an EX495 in the US and ship it to Prague. Now I think I will buy the Data Vault X510 as it is sold locally. The Mac backup and music sharing are primary reasons (loved seeing your Ozomatli example) but am disappointed the video streaming is flaky. Hoping for an upgrade, if not already included in SP3. The information you provide is priceless. I will use your pages as the primary source of information, and ask more once the server is running. Appreciate the information and guidance. Thanks for your comments, Jeff, I’m glad the review was helpful to you! Definitely join the forums and let us know how you like your DataVault once you’re up and running. I have a question. Currently, I have a few external hard drives that I do work on (like photoshop..). The files that I work on are keep on the external hard drives. Will this hp ex490 be a good replacement for those external hard drive? I meant I will get rid of those hard drives and work directly onto this hp ex490. And this ex490 will help keep a back up onto another drive. Also, will the ethernet connect be comparable to the usb connection that I have right now with the external hard drives? will working directly onto the drive be okay with a hp ex490 or do I need a better processor from hp ex495? Please help. Thanks so much. I personally use the server to store and backup my photos, however I also keep a local copy of files on my PC because it’s faster and more efficient to access. USB drives can be pretty slow, though, so you may not notice the speed difference as much. I do believe that the MediaSmart Server is a great storage and backup solution, better than the USB drives you’re currently using, so would suggest you give it serious consideration. And definitely post in the forums to get input from more members of the community. Thanks for your reply!! I have been browsing in the forums for some information. I am definitely interested in getting the hp ex490. I have a couple more questions. With the hp ex490, will I be able to specify the location of the hard drive mirror? (For example Main drive will mirror with drive #2, and drive #3 mirror with drive #4?) Also, will I be able to control which data store in which drive or will hp do all those and I will never be able to find out where the data is store? The reason I am asking is in-case later, I want to take one drive out and make it an external hard drive or something. There is no direct drive mirror, the feature provided by WHS will provide file duplication which ensures that any file is stored on more than one physical disk. This is configured on a per-share basis. WHS will choose where to store the files (the algorithm is published in the Drive Extender white paper, see the forums) and discussed in the forums. You have no choice of where WHS stores your data, however you can add and remove drives as you need them and WHS will make sure all data is successfully removed before it allows you to remove the drive. The drives are also formatted with NTFS, so in the event of some catastrophic failure of the system you can remove the drives, connect them to your computer, and retrieve your data. i have read your reviews about the x510 and the ex490/495. very helpfull. my situation is for a home user the folowing: my wife and i have both 3pc each: 1 for downloading and trying software, 1 for working and serious stuff, and 1 backup if the work pc fails. we have a lot of music files, and for that we bought a netgear readynas duo (2x 1Tb). all music is tagged and copied to the nas, with all important documents as backup. now we want a automated backup of the nas, and snapshots of the system partions of each pc. so we need a lot of diskspace. make snapshots of the pc’s to the x510. i suppose this is possible, and after that once a month a addition to this so in case some pc breaks, i can restore easely. is that standard available in the x510 / WHS?? also i want to make a backup of the nas once a month, and every week a incremental/differential backup. and after full backup 3 has been made, delete the first month. is this possible?? or do you advise a plug in?? most of the multimedia streaming is done on the nas, so not important on the q510, only automated backup and lots of storage. by the way, if i buy the 1Tb version, and want to add disk after that, wat is the limit of disksize to be added? 3x 1.5 or 3x 2Tb?? i hope i made my wishes clear to you, i think the q510 is an excellent addition to my network and certainly not expensive compared an empty 4 disk qnap or netgear. My reviews don’t generally cover the basic feature set of WHS, so I’ll recommend you read about the WHS features, in particular the client backup info will be helpful to you. Your PCs will be backed up nightly by WHS and offers full OS restore as well as single file restore. To sync your NAS to the server, I’d probably recommend you use something like Robocopy or similar as a scheduled task running on the server to pull backups from the NAS. Any size SATA drive can be installed, so you could add up to 3 internal 2TB drives. thanks for your quick reply. this has convinced me for about 90% that i am on the right track. i will look deeper into WHS, and hopefully the prices will drop a little more, so i go for the X510. I have been interested in the HP EX490 for some time now, and have read a lot about it at your site, great work! Yesterday I found a HP X510 cheaper than the EX490, so I have compared them and see that the X510 use a Intel 5520 chipset and the EX490 use a Intel G33 chipset, do you know what the main differences is between these two? I live in Denmark and we haven’t got the EX495, so the E5200 cpu is just an extra bonus at that price! Hi Anders, the EX490, EX495, and X510 DataVault all use the same hardware, in fact the X510 is identical to the EX495 with the only difference being the capacity of hard drive included. I suspect there is a mis-print in the documentation if you’re seeing a chipset difference. If you can get an X510 for less than the EX490, I would jump all over that! Thanks for your quick reply, Alex! I’ll make an order right now, thanks a lot for your help. version is cheaper than the english one. I just received my X510 today and was wondering if you know if there is a way to add a static IP to this device? Cant seem to find anything in the documentation. Hi Joe, check this forum topic for some discussion on the pros and cons of static IPs on the server. If you still want to do so, you’ll need to access the server via Remote Desktop and configure it. Be sure not to make any mistakes as if you mis-configure the network settings a Server Recovery may be required. Thank you, that worked perfectly. Next question, can I install my own virus scanning software? Due to the way Drive Extender manages data stored on the server, it is recommended to use a virus scanner that is designed to work with WHS. The forums have lots of discussion about people’s preferred vendor, a search should turn up lots of info. Is it true, that the data vault products can only take 3 hard disks (whereas the mediasmart servers can take up to 4)? All shops I checked, list it as up to 3 disks, but it seems to have 4 drive bays. The DataVault is identical to the EX495 MediaSmart Server, and can accept a total of 4 internal drives. The literature you’re seeing likely refers to the 3 additional drives it can support since it ships with a single drive. Alex, thanks for the quick answer. BTW: Is it possible to install standard software on these devices (e.g. a subversion server running as a windows service) or are they somehow limited in that area? Sure, you can install anything as long as it is supported on Server 2003. You’d access the server via Remote Desktop to do that, check in the Wiki for instructions if you’d like. - can the HP Software Update 3.0 also be installed on the DataVault server (I guess so, since they are identical)? thanks a lot for you support. Hi Martin, the hardware is identical between the MediaSmart Server EX495 and the DataVault, the only difference would be a couple of watts depending on the stock hard drive included with your purchase. They are also running identical versions of the 3.0 software, so no update is needed. X510 1TB arrived this week after a seven week order time. CZ evidently does not stock WHS devices. 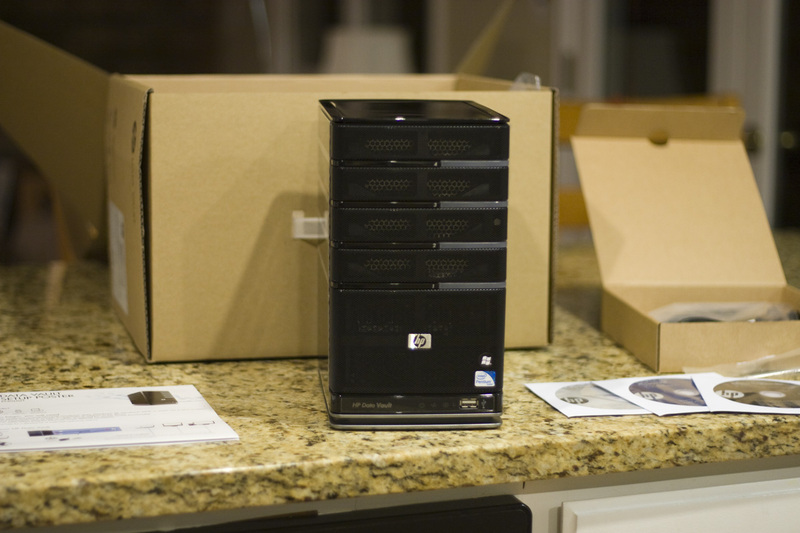 Anxiously unboxing and connecting resulted in first realization – server was sourced from Germany. I downloaded EN versions of the Connector SW, Restore CD, and Toolkit, however Connector cannot complete due to language mismatch. Jeff, WHS requires that your clients and server be the same language. If you’ve got all english PCs, your best bet is to contact HP support and attempt to get the software from them. Otherwise return the server to the place you bought it and try to purchase an English model. I have a set of EN software from a friend, but it is a complicated road getting the disk reloaded since there is not kb or monitor. I am sure HP ships the server with a img that is ready to finalize once turned on, but I don’t have that advantage. So far, I attached the hd in another pc, booted from OEM WHS DVD, and ran through “reinstall.” Looking back now, I will need to purchase a USB DVD player to get everything working, since the bootable thumb drive did not take in the X510. Probably because I can’t get to BIOS to set boot from USB. Anyway, the HD requires to be in final resting place during install to get drivers correct. Next attempt will be to start the install in another PC until files are copied until first reboot. Then move to X510 with external USB CD. That should get correct drivers in place while installing in “invisible” mode. Any ideas are welcome, or comments about how to get WHS to boot from Thumb drive. thanks for the info Alex. I just bought an x510 to replace a busted ex490. I was concerned that there might be a difference, but i guess there is not. I bought the x510 vs the ex495 because newegg.com had the x510 1TB model on sale for $599. Alex, I really appreciate all the great info and reviews. Your willingness to respond to all these individual queries is truly outstanding. We’ve run a small service business and have a home-brew database app (Access 2007) that is effectively our CRM. (I know, there are a gazillion CRM apps out there, why create another one? Very specialized requirements.) Anyway, we’ve been running the app by sharing the data file from an office client machine. Not surprisingly, at just 200MB, performance is beginning to drag. We’re also in search of easier, faster, more reliable backup (incl clients) and remote access to that app data file (among others). We’ve been looking at the X-510 but are seeing little mention in reviews of it’s file sharing capability, performance and limitations. Any opinions or guidance in this respect would be gratefully accepted. Hi Chris, thanks for your comments. People seem to have mixed opinions about whether to use the Windows Home Server for file serving. The main drawback is the lack of VSS for file versioning. On the other hand, the MediaSmart Servers (and DataVault) are recognized for having excellent network performance. Regardless of whether you choose to use the DataVault as a file server, it does make an outstanding backup server and many small businesses use it for that capacity alone. Combined with centralized storage and the Remote Access features, it sounds like it could very well meet your needs. I have been tinkering with making my own NAS/Media server and have several extra copies of Windows 7 home premium available. My primary use is going to be using the server for storing all my pictures, media, and files. I have an xbox 360 and some of my tv’s connected to kodak media streamers. Right now all of my media sharing is coming off my main computer running windows 7 and everything is very simple and easy because of the homegroup features and windows media center. My question is would buying a data vault be a better solution than building my own media server based on windows 7 home premium. I understand that the automated backups and media gathering would be an advantage of the data vault but I currently use something like syncback to syncronize all my drives which while not as elegant as the hp product it does get the job done. I was going to have my own server use raid 1 on all drives for auto disaster recovery and while not as elegant the hp does have the data duplication. The data vault looks almost perfect but my only concern is the media streaming capabilities with my xbox 360 and kodak media streamer devices. Those are definitely valid questions. If you have more than one PC, the Windows Home Server has a huge advantage with the automated nightly backups that are full OS images and allow you to restore your PC quickly in the event of a drive failure, virus, etc. The Drive Extender technology also has advantages over RAID in that you can grow the storage volume just by adding a new drive, rather than having matched volumes for a RAID1 array that can be cumbersome to grow when your storage needs increase. Combined with the low power consumption, small form factor, and expandability of the DataVault, I believe it is a super solution. It comes with built-in Media Streaming capabilities via Windows Media Connect 2.0 and Twonky, but if you’re using PCs to access your content then the Server shares will automatically show up in your Windows 7 libraries where you can easily access it just as you are currently. Thats perfect and I think you have just sold me on getting a Data Vault especially since they are on sale right now for only $599 at an egg store. Great to hear, definitely post back either here or preferably in the forums to let us know how you like it! For reference, here’s the link to Newegg for the sale you mention. i had both an EX490 modded up to an E8400 CPU and replaced it with the x510 data vault. IMHO, the data vault it faster for tranfers to the disks. i can’t explain it, but it just is. i know the x510 and 495 are supposed to be the same, but i think the x510 is faster. i would never give up or sell my x510. it ROCKS! x510 1 TB version with three (3) WD20EADS. eSata connected to a Sans Digital TR5M-B with five (5) W20EADS. i get sustained data tranfers of 90 – 100 MB / sec…. i love it….. It is breaking my heart to see all the comments about how wonderful the x510 is and how it is a dynamic component in the home network environment. After waiting months for the x510 to arrive, initial disappointment was the German OS. Almost two more months, and I am still chasing HP Partner (either not able or not willing to help), additional pleadings with other HP Partners unsucessful. Last one said the line is not sold in Czech Republic, so they can not help. Just spoke with a friend about a Fujitsu Siemens NAS that seems to offer similar functionality, so unless someone can offer me a link to download the Server Recovery DVD, I will have to return the HP, and go for something that works. So close, and yet so far… Just for interest, I did try to reinstall WHS (EN version), but not possible on a headless box to get everything back in place (drivers the most challanging). So I will shed a tear onto the beatuiful (yet functionless) x510 as I am placing it back in the box. Alex, thank you for all the wonderful insight leading to the purchase and even more gratitude to all your contributors for the great ideas on how to use the Storagevault. Keep up the great work, and I will check back for WHS tips and tricks. finally got my x510. been away for some weeks, so got some time to work it. before i start, maybe you can help me. i looked everywhere on the unit and box it came in, but i cannot find the mac adress. why?? my router is giving fixed ip adresses to all my equipment depending on mac adress. or do i have to switch this off in my router, and install everything, look in the configuration for mac adress and switch the filtering on again?? The MAC address is only printed on the motherboard inside the case, to the best of my knowledge. It will appear in WHS once you’ve got it set up. I’d recommend just enabling DHCP in your router for a little while to get the server setup. the version of software on ‘my-pc’ is not compatible with the server. please uninstal the client software, and reinstall from the server. i cannot find anywher in my remove programs a HP Media Collector, so don’t know how to remove. and how can i reinstall it from the server. or is it wrong to use the 64 win-7 pc, and uninstall it, and reinstall everything on a 32 bit pc?? or do i have to learn to live with this? thing is, i don;t want to use this server for media sharing, that is what i have a netgear for. this is mostly for making backups from system disks of pc’s, all the foto’s and music and documents, and a backup from the readynas. That is due to the HP software updating itself on the Server but not on the client. You need to completely uninstall the HP MediaSmart Server software on the client, and reinstall it from the server Software\oem\ shared folder. Alex, you are great. all starts to come together here. i hope this will be my final question for the near furure. i am no fan of twonky media, on my readynas i use logitech squeezeserver. i allready have the add-in for this, but can i remove twonky?? i cannot find it in the installed add-ins. or just disable it, and leave it. and is it true that you can enable jumbo frames on this x510?? and how. @Patrick, I’m glad you’re getting your questions answered and thanks for the feedback. I’d recommend leaving Twonky installed, it is integrated into the HP software and provides features beyond squeezecenter that you may want to try down the road. Simply disable it, the easiest way is via the “Media Server” sub-tab of the HP tab in the Server Console. I’d also recommend you test the effectiveness of Jumbo Frames in your network, they often end up causing more harm than benefit. I have a HP EX485 MediaSmart Home Server and was curious if it was possible to upgrade it to the HP StorageWorks X510. From what I’ve read would it just be a cpu swap going from the current Intel Celeron 2.0 Ghz to Intel Pentium E5200 2.5 GHz Dual-Core? Hi Dwight, there are some other component differences (see my EX495 review), most notably the eSATA port supporting port multipliers in the EX49x and DataVault servers. However, if you follow the CPU upgrade guide on this site (or in the forums) to a dual-core and perform the 3.0 upgrade, you’d have a server that is very similar to the DataVault. Just curious, is there any reason I would want to buy the X510 with 1TB vs the EX495 with 1.5TB if the price is the same? Are they really the same thing with software differences only. This is for home use. @Dennis – the X510 is available in some markets that the 495 is not (Europe), and the X510 warranty has been extended to 3 years from the 1 year of the EX495. Otherwise they are functionally identical except for disk capacity, and those can be upgraded. I have a small network setup with 8 computers. I need to upgrade and was thinking of buying a business server. However I do not have any experience with servers. I want an item which is cost effective and that I can work at. The WHS sounds like it would suit my application very well allow I have a few queries. - Can more than 10 windows based computer excess the WHS? I don’t want their information backed up onto the server just that they can excess it? - What way will the WHS appear on the individual computers? Do I need to install software or can I map the WHS as a network drive onto each computer. - What way does the system mirror the information onto the hard drives? Raid or ? - If the storage works fails. Can I take a hard drive out of the storage works and make it into a slave and read the information of any computer or do I need to buy another storage works to read the information? - Can I have two storage works on the same network? I know I have a lot of question but would like to know information before I purchase the system. The concept of the system is great and allows small companies an easy, affordable server. Yes, more than 10 PCs can access the server, the 10 client limitation applies to the computers that can be joined to the server for backups, and for user accounts that can be created. You’d have to share user accounts on some of the clients in order to access the server, or enable the Guest account. If you install the connector you’ll get shortcuts to the network shares. Otherwise you can just map drives, they are standard SMB/CIFS shares. Read about “Drive Extender”, I’ve got an article here that describes it’s benefits over RAID, a search will turn up lots of discussion. Yes, the drives are NTFS formatted and readable on any PC for easy access to the data in the event the server dies. Yes, multiple servers can exist on the network, though only one can be configured with Remote Access using UPnP. If you want them both to have remote access you’ll need to do some custom port forwarding on your router. Multiple servers is a good way to back up more than 10 PCs. I have a followup question to Gary’s. We have a 2000 Server right now that is only a file server for three computers. The computers only connect to the server to retrieve files and can run just fine if the server is off or fails. All our printers are setup with an IP address so they do not run through the server as well. We neeed something that is central for all our files, backs up the machines and something that we can back up as well for disaster recovery. Our computer consultant wants to get us a new server to the tune of $8K and I am unsure if that is the best option. Could the x510 seem reasonable as a replacement? Hi Kolin, I believe the X510 DataVault could fit your needs, but one important consideration may be that it does not support Previous Versions where you can restore older versions of files that are stored on the server. You of course will have backups of the client PCs, and any backups you take of the server shared folders, but not the specific Previous Versions feature. Also, the built-in server backup tools are all manual at this point, not automated, though it can be scripted via robocopy or a similar utility. Even if you decide that you still have need for a more professional file server, I’d suggest you consider the DataVault even if only for the Client backups. Another option might be to get hardware that could run a couple of virtual machines, one as a file server and also a small Windows Home Server instance for your backups. Alex, I’m thinking of getting a X510 data vault, for the purpose of streaming movie files(upto 20GB) to extenders. I have a gig network in place. Does the 510 have the power to stream uninterupted to an extender? Can it do 2 or 3 at a time? Would I be able to download those files and watch them if i’m on the road? I know it’s a lot of questions, but I do not want to spend the money until I know. i have an X510 with 3 WD TV Lives connected to my HD Tv’s. I can easily stream HD mkv files to all 3 at the same. i can also while 3 movies are playing, listen to Squeezebox server streams, run uTorrent with 5 -10 torrents going, all at the same time. never ever an issue. What are your 3 WD Lives? What are HD mkv files, i want to stream VIDEO_TS files. Any thoughts? WD TV Lives are media players. They play just about any and all file types. mkv is a video container. they are typically 10 – 20 GB in size each per movie. you can play VOB’s with a WD TV Live for sure. Gary, the server is capable of supporting multiple HD streams, obviously it will depend on your network speed and the bitrate of your files. What extender are you using? I ask because it could affect whether you use UPnP streaming or directly access the network shares via SMB or NFS. As for “downloading and watching on the road”, the server does support the remote video streaming, however it requires a mobile version of your content that is most easily made by the Video Converter. This is streaming, though, and not downloading. You could also sync the mobile versions to your portable device. WD looks nice at the right price! The only thing I would want, is some internal storage to run My Movies, a free program that catagorizes and displays all your movies with a windows based computer. Do you just look at the file structure in WHS to select a movie to play? Right now I’m using an XBox 360 and A windows 7 based extender from Aspen Media Products. I also use my labtops with media center on them. Can this server also be run as a type of Sharepoint, where people can remotely view and print documents from the server? Gary, there is a remote access site that allows authenticated users to upload and download files. It’s also possible to install additional software on the server, either via Add-Ins that fully integrate with Windows Home Server, or manually installing yourself via Remote Desktop. Here’s a tutorial for installing Sharepoint. I have been watching Newegg for a sale on the EX495, but they put the Storage Works X510 Data Vault on sale today instead ($449). From what I have read, the X510 gives you a 3 year warranty compared to the 1 year warranty for the EX495. The X510 comes with a 1TB drive while the EX495 comes with a 1.5TB drive. Otherwise, there are no major differences in either hardware or software that would lead me to wait for a sale on the EX495? I am newbie in media smart server. I just want to ask you regarding X510. If I have several external hd and want to back up all of them, can i simply plug my external hd via USB to X510? Does it automatically backup all of my data in my external hd? If not, Do I need to plug my external hd to my laptop or PC and manually backup to X510? Fred, as I mention in the article, the hardware and software of the EX495 and X510 are the same. Kenny, there is no automatic process, but you can manually copy files onto the server via your client PC or by connecting the drive to the server and using Remote Desktop. We’ve got a Wiki article that explains how to accomplish this. I have a difficulty with my X510. I attached my external storage to X510 via USB connection. Then, I started transferring the data using remote connection. However, once the transfer started, after 10 minutes, my X510 could not recognize the external storage. I did several attempt and it always come up with the same problem. Do you know how to overcome this problem? Kenny, I’ve not heard of such a problem, which USB port are you connected to? What is the error you get? You can try copying the files from your client PC, it will be slower but may complete. I did several attempts. First, I connected to the USB port in the back. Then, that problem came up. Second, I connected to the front USB port. The same problem happened again. Then, I restarted X510, and then plug it again in the front. The same problem happened again. However, after I post my message in this forum, I tried to reconnect it again to the USB port in the back. Then, I transfer my data little by little. So far so good. I don’t know why if I transfer the data at once, my X510 couldn’t recognize the external hd after several minutes. Just for your information, my external data is using Fat32. The error message that I got was “Windows could not recognize the path”. Then, when I clicked my computer using remote connection, X510 couldn’t recognize my external HD. However, the weird thing, when I launched my Windows Home Server Console, in the server storage, X510 can still recognize the external HD. Do you know what kind of problem it is? If the smaller individual copies are working you may need to proceed with that. Otherwise try the copy from the client. I’ve never experienced the problem you are encountering so unfortunately don’t know how to advise you to resolve it. still happy with the X510. works fine, backup are good, and also it copies to the readynas an extra incremental backup of my music, films and photo’s (initiated from the nas). 0 days remain before your evaluation copy of Windows Home Server expires. can you tell me what to do?? the X510 keeps working until now. Patrick, I’m glad it’s working well for you. Do you see that expiration notice all the time or just occasionally? You should not be getting that message, you may want to contact HP support to see what they suggest. well i guess now 3 times seen. i have all the errors sent to me by mail, that is why i noticed. first i get an error, than after a few minutes, i get a message that the error is cleared, but the text is the same in both. i will contact hp support. What are the steps of getting my x510 Data Vault re-installed properly? My 1TB hard drive in the system was replaced with a new drive and I cannot find any documentation on how to do this. Failure. Click Help for information on how to address the problem. Step 2 of 4 failed. There was an unidentified error. So, with this I am still stuck and not sure what to do next to get my Data Vault back up and running. We’ve got several topics in the forums on the Server Recovery process for the DataVault and EX49x servers, I’d suggest you start here, do a search in the forums, and then post a new topic if you’re still having issues. I bought this one with 6TB (4 drives) and I have to say it’s the worst HP product ever. It keeps crashing daily basis. Constant runtime errors on web interface. Can’t loggin to home server console. Accounts get locked by it self. Media streaming crashes the server etc. And the stupid box drops out from my local network all the time. I think the problem is the Home Server software it self. Microsoft’s products simply are not for systems like this. The software on the homeserver is up-to-date and after hard reboot it works for a while… few hours or day. Then is all pete tong again. Henry, sorry to hear you are having so many issues with your server. While WHS and the MSS has it’s quirks, most people seem to have a much better experience. I expect that we could help you figure out some of the issues if you’d care to post more details in the forums about the specific issues you are having. i am having some problems. at this moment, my x510 starts up, but the health light keeps blinking on off every 1 second. harddisk lights (got 2 disks) will remain off. and this is now going on for over 24 hrs, without change. i did not yet did a server recovery, and have the feeling i do not hear the disks. You’ll get the best support by posting more details in the Troubleshooting area of the forums where myself and the community can help you. Before you post you should do a search in the forums on “blinking blue health light” as there have been many discussions about what to do when this occurs. I have a question regarding my X510. Do you know the reason why my X510 is having a difficulty to wake the server through the windows home console options? Usually, when i click “Wake Server” command from my windows home console, my X510 will start booting. However, recently, it has not been the case. Do you know if I need to run something? i have 3 hdd’s in the x510, al 1Gig. so total size is 2,73TB, and free space is 1,82TB. when i map a share as a networkdrive i got a red indicator, saying that i have 1,81TB of 991GB free. it is not worrying me, but i just cannot explain this. maybe you can?? I’m glad it’s working well for you. That’s a side effect of how Drive Extender works, it’s typical and nothing to worry about. You can search the forums for specific details if you’d like more info. Hello there, I have a question about the possibility of upgrading the X510 to the latest WHS 2011. I have an X510 with an 8TB configuration, 4x2TB HDD, 24×7 constant on server reliability drives. Occasionally I do have power outages. Before the capacity upgrade of the X510 to 8TB I lost a 1TB HDD due to hardware fault and consequently I irrecoverably lost all my earlier backups containing some deleted files and folders I may have desired to restore later, as they were not stored with folder duplication, like the shared folders electively are. There is no way to enable folder duplication for the automatic backup destinations, to save them from such events, WHS manages that by itself entirely. If the backup database – appears to have only single copy held – has become corrupt, God save the earlier backups … because the HP WHS X510 won’t. Most recently, another power outage caused my 900GB MAC shared folder (the backup partition for my Mac notebooks) to become corrupt (it is replicated though), but I still have to back it up and reformat it to fix the corruption. The server backup process to external eSATA drives is a bit annoying, as there is no feedback indication anything is happening for a very long time. It really should be logarithmic progress display, some feedback to confirm it has not hung right at the start, just has not reached the 1% (the smallest increment on the progress bar it will display) of the large (e.g. 900 GB) folder it is backing up. Even though the core server of WHS is a fully multiuser, multi-tasking OS W2K3, while backing itself (actually, just a single shared folder!) up to an external drive, it becomes so bogged down that it is turned into a single tasking system, the only other task you may be able to run is to look at the help file about backing up the server … what a shame. I would be really interested in upgrading it to the WHS 2011, if HP has released its X510 wrapper for it. Can I please have a feedback regarding that? Is there an improvement with the 2011 version in the areas of my listed concerns? * The backup database is meant to be backups of your clients, not long term archival and storage of files. The expectation is that two copies exist – the client PC itself and the backup stored on the server. Those files you lost should have been stored in the Shared Folders with Duplication enabled if they were important to you and did not also reside on the PC. * My impression of the server backup is that the progress meter is file based not data size based, but I could be wrong. As to if WHS 2011 resolves those issues, I’d say probably not much. Power outages are still going to be bad for your computer and your data, you really need a UPS. There is no longer build-in duplication, so you’ll want/need RAID to protect your data which will also allow you to duplicate the backup database. I do expect server backup will be a bit more reliable and performant for you, though OS X Lion has broken the Time Machine backups that used to work previously. Firstly thanks for the time taken to read my long post and the valuable answers. I will try your Add-on to duplicate the client backup database. Slightly disagree with you on the importance and occasional need for some files that only exist on older backups in an automated backup sequence (grandfather-father-son and daily-weekly-monthly backup retention; otherwise why on earth we have those? ), but as those lost backups have long gone, it is water under the bridge…, so I will not pursue an argument on it. The need for UPS has been recognized, I actually have an HP 2200XR unit that failed recently, but it is not economical to repair and another needs to be purchased. With all other computing equipment I need around 2200VA/1500W – and at that level the UPS are getting expensive. Has anyone converted the HP server into a software RAID5 system? Thanks again for your answers! I said that was the intended use model of the client backups (from Microsoft), since I wrote an Add-In to enable duplication and allow backups of the backup database, I obviously agree that there can be a need to protect the backup database. You can get a cheap UPS just for your server since it (in theory) contains the most critical data, and use the Grid Junction Add-In to manage it via WHS. Good call on testing WHS 2011 with spare disks, post in the forums and let us know how it goes. Can you use the datavault to host a website IIS or use Exchange features? You can host a website with IIS, though there’s no configuration options within the Home Server Console so you’ll need to set it up yourself. I believe older versions of Exchange can work with WHS but not the newer versions, I’m no Exchange expert though. I recommend you check the General forum and do a search, there’s multiple discussions on recommended hard drives. Advanced Format drives aren’t supported, but do work fine, a search on “Advanced Format” will turn up some blog posts and forum discussions on what you need to get them working. If you must have non-Advanced Format drives, people seem to like the Western Digital Black drives.